I have not made Texas caviar for a while. It always feels a little bit daunting when I imagine all the chopping that must be done. I do love chopping up vegetables but I do not like chopping up tomatoes with their unbelievably tough skin. I have made Texas caviar with canned tomatoes but it is not nearly as good. Kitchen tip – a ceramic knife does a great job cutting up tomatoes. Be careful, though, ceramic knives are really, really sharp. 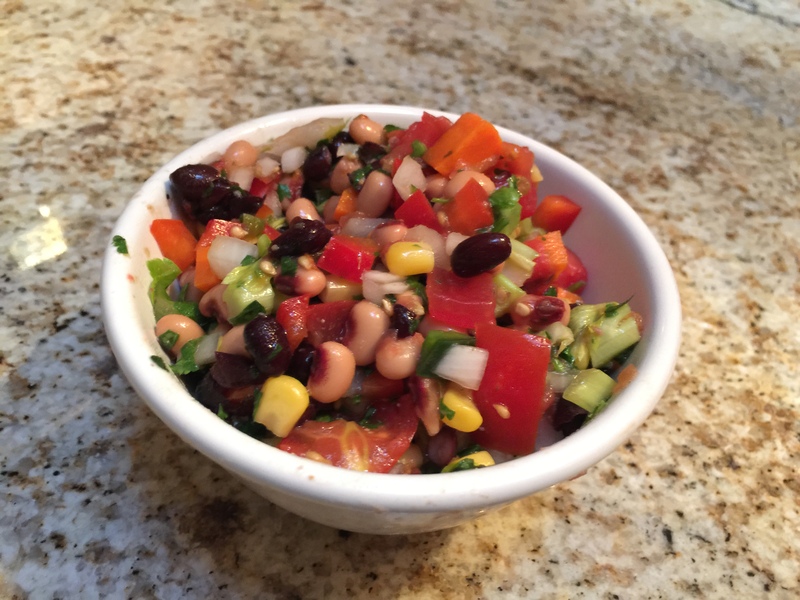 SORT OF A RECIPE FOR TEXAS CAVIAR: It is basically two cans of beans rinsed and drained (I use black beans and black eyed peas), diced tomatoes, celery, carrots, spicy chile (I used a spicy poblano), onion, and green onion. I also add chopped up cilantro and some frozen corn kernels. Season it with salt, pepper, cumin, and chipotle chile powder for a smoky back note. Add olive oil and vinegar or use some Italian dressing and add extra vinegar and lime juice.) I wish I could tell you exact amounts. Start out with about equal amounts of the vegetables, add about 1/4 cup of the dressing plus 2 teaspoons of cider vinegar and the juice of a lime. Keep tasting it. It will probably need a little more salt and cumin than you think. Along with the Texas caviar our dinner consists of some skin-on, bone-in chicken thighs that John grills. They come out juicy and charred. Unexpectedly he also makes some chicharrones out of some extra chicken skin. So delicious!! We serve the thighs with some extra BBQ sauce. This is definitely a dinner that tastes like the best of summer. 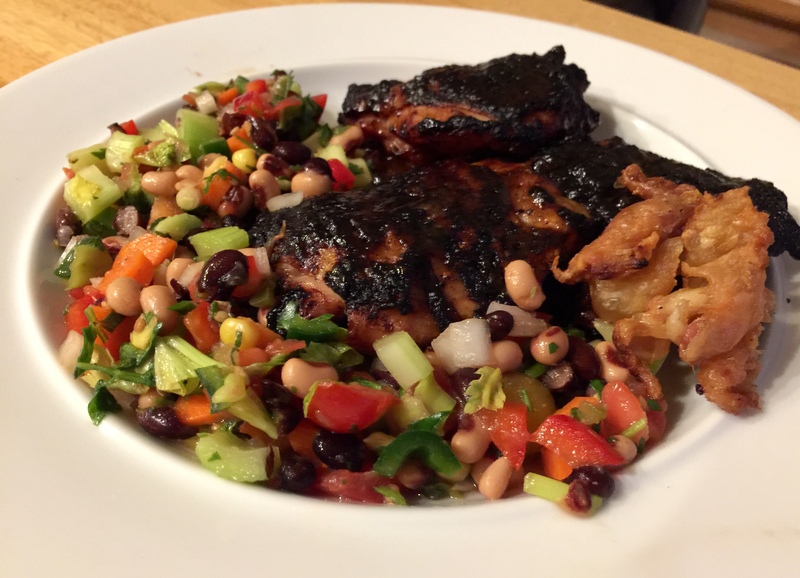 This entry was posted in American, Grilling, Kitchen tips, Legumes, Poultry, Recipes, Vegetables and tagged chicken thighs, Grilling, Texas caviar. Bookmark the permalink.